Shower Panels are the means to ensure you have utmost safety and comfort while bathing. A shower panel is basically a showering system with the spout for your bathtub, a handheld shower with a shower head on the top. Some also have the added functionality of nozzles which massage the whole body. These panels can be of different designs and offer different features. This article is written to guide you to the best shower panels available, in terms of functionality, benefits and design. We, at ShowerHacks.com have reviewed these products thoroughly to write the article, and suggest you the best products available on the market. What is a Shower Panel? How to Buy a Shower Panel? Do You Want a Shower Panel with Batteries? A shower panel is a combination of overhead showerheads, handheld wand and a variety of controls on the side. A standard shower panel also features massaging jets that combine with waterfall/rainfall showerhead to provide complete bathing experience for the user. There are different types of shower panels that one can buy. Some feature the “Temperature Monitor and Control” system. Others are pretty basic with the spray controls only. Best shower panels come with displays that run on batteries. Of course, the price will vary according to the bells and whistles that you want on your device. Like many things on the face of the earth, to purchase a shower panel is not that easy. You can’t point the finger at one and buy that off the bat. Choosing the one product that is “Best” for you matters. I hope the following factors will help you in your purchase. Full shower systems are not things you can buy over and over. You’ll probably buy one for a few years. It is important that the panel you buy lasts longer than most. For that, it needs to be made of sturdy materials like stainless steel. These materials should also be “Water Spot Proof” since you are using the accessory in your bathroom. Some people want their panel to stand out. If you’re in that category, try your hands on products that have chrome, glass or bronze as materials. These will make your product classy and suitable for your lavish bathroom. But it will cost you above average amount as well. Decor Star 004-SS Stainless Steel Rainfall Shower Panel comes with a stainless steel brushed finish. It is pleasing to the eyes. The frame bends into a showerhead at the top. This shower panel gives you the benefits of a rain shower, waterfall, the massage spray and also a hand shower to go with it. You can turn on the functions via the buttons at the center of the panel individually. Also, you can access all the functions simultaneously at the same time. This shower panel features 100 horizontal spray nozzles and 50 Rainfall nozzles to provide you comprehensive bathing experience. Controlling the water temperature is easy. Just turn a knob and regulate the water flow rate. Blue Ocean 52" Aluminum SPA392M Shower Panel comes with a sleek All-Steel design. Besides attractive design, you can select between rainfall shower head, handheld shower, and spout if you want to bathe in a tub. You can have a shower with it even in areas where the water pressure is low. People can even monitor the temperature of the water, thanks to its’ digital temperature gauge. Additionally, 8 jet nozzles ensure water reaches whole body when you shower. Installation is easy; this best shower head comes with the equipment required. It meets ISO 9001 standards assuring the users of its quality. Plus, to cover for damages, it has limited warranty from the manufacturer. If you want to know, how to work the shower panel? Simply you can watch the video.This video created by our friend Maciej Piotrowski. The Blue Ocean 52" Stainless Steel SPV878392H Shower Panel is almost identical to the previous product on the list. It has a surface of 5mm Tempered Blue Glass which makes it glossy. The design allows people to install it on flat walls. The durability is further enhanced by pipes which are re-enforced to last long. You will have superlative performance in the extreme low water pressure of 28psi. It works equally well when the water pressure reaches 72psi. People can change the temperature of the water with a switch, and the hose connects directly with the water line to save you the trouble of assembling small parts. Chrome Plated Hose fends off the rust and enforces durability. The user from any damage that the showerhead might encounter. Aside from all the standard features of shower panel, this AKDY product comes with an LED rain shower on the top. The AKDY 52" Rain Style Massage System features a tempered glass which serves as a looking glass when you are taking a bath. Fits standard water pipes and installs easily to save people hours of time.It is also suitable for areas where the water pressure is on the downside (29psi lowest and 72.7psi highest). You can use this showerhead as a tub spout and also take showers using the best handheld shower head. There is a safety panel made of glass to prevent you from any unpleasant accidents that may occur. The AKDY shower panel also features cover the damages of the entire board. The AKDY® 52" Tempered Glass Aluminum Shower Panel Az787392M Rain Style Massage System features a digital temperature gauge that sets it apart from the competition. Also, you have zinc alloy knobs that last really long. There are as many as 8 jets to deliver the massage style water-flow to your whole body. When showering, you will have the option to turn on any of the nozzles separately without triggering them all on. You will find your ½ inch water connection perfect for this system. Installing it is easy and operating it is even easier. One of the great positives of this equipment is that AKDY has ensured it is safe for use, and available at a great price. However, you won’t have any instructions included about how to use it. Just improvise and you will find a setting that is suitable for you. 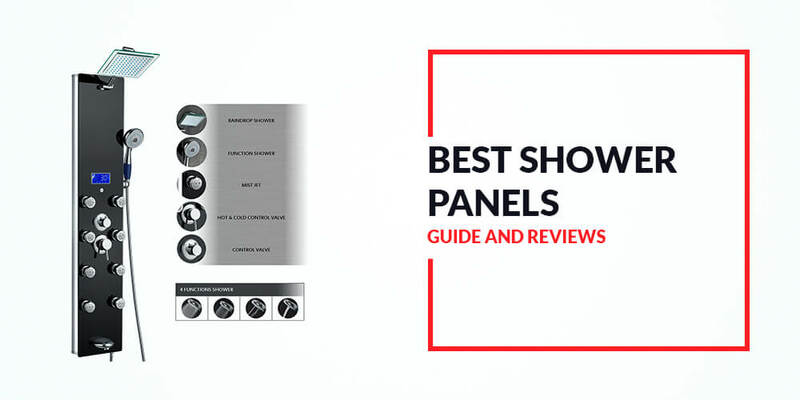 Decor Star 006-SS EZ Panel is for users who want to quickly install their shower panel without any hassle. In fact, the owner can set this thing up himself due to the EZ Connect technology. Another thing great about the shower panel is the frame. It is made of stainless steel. You can expect it to be free from any mold, stain, and rust in the long run of things. You can cycle through four different functions while using the shower panel. For example, rainfall and waterfall provide thorough cleaning experience. Horizontal Massage enables water to trickle down causing therapeutic massage on your body. Then there is the standard “Handheld Shower Mode”. As far as the hand shower is concerned, you get a brass handle that makes the showerhead easy to grip. Also, the hose it is attached to is 59-inch long. That makes using the handheld showerhead all the more convenient. Manufacturers put some though it the design. A lot of options for shower. Nozzles are easy to clean. One function works at a time. People that are looking to add a bit of luxury to their bathrooms should look no further than Blue Ocean SPS8727 Thermostatic shower panel. Stainless steel construction and the brushed finish will provide the much-needed class that you seek for your bathroom. Unlike most of the showerheads of it's class, the SPS8727 from Blue Ocean is lightweight but durable as hell. It is meant for flat walls. This one comes with a “Rainfall” and “Waterfall” spraying options. In addition to them, you have four different sets of body jets. You can use these shower options one at a time, or you can combine any two at once. People can use their standard 1/2-inch plumbing connections to install this thing. Also, be sure that you connect your hot and cold water pipes directly for them to work in perfect sync. Also, a thermostatic valve is in place so that the water temperature doesn’t change weaver at all. This shower panel is protected against all defects and damages through Excellence warranty. Looks nice for the price. Water Pressure is also great. Shower Functions work perfectly with the water pressure. Hand shower is particularly strong. The shower panel is open on the back 1/3rd of the top. If you are suffering from “Water Pressure Issues”, running more than two settings is a problem. This stainless steel-made shower panel can be mounted on any wall surface that you can think of. AKDY 63" SP0047 Shower Panel supports simultaneous functions. Meaning, you can use this panel without compromising water pressure while all functions are turned on. The surprises don’t end there. You have 100 nozzles on the shower panel to clean yourselves effectively. The controls are well laid out. Anyone can understand how to use the panel just from using it the first time. Just use the handheld wand to control speeds and shower patterns. This is one of the best shower panels due to the ease of installation. Anyone can do it. Simply, the parts required for the assembly are included in the package. The panel is “Thermostatic.” Means, it keeps the temperature of the water stable for an extended period. Simultaneous functions offer great showering experience. Water pressure is perfect for areas with low PSI. This product is not “Spot Proof” as one would expect. Golden Vantage 63″ Multi-Function Panel next entry on my list has all the conveniences of an expensive shower panel system within a low price-tag. You won’t even need a plumber to get this thing in place. Shower enthusiasts can enjoy both rainfall and waterfall showers thanks to the overhead showerhead that comes with the shower panel. The overhead showering system has 50 different nozzles to provide drenching shower to users. Overall, you have 100 nozzles built-in this shower panel to provide a massaging shower. If you are dwelling on the water being too hot or too cold to use, don’t. The thermostatic controls allow you to control the water temperature to suit your liking. If you want to renovate your bathroom and get yourselves a bathtub, this shower panel features a spout that fills up your bathtub in minutes. This amazing unit is backed up by manufacturing warranty. The panel looks classy and is durable. You can install it nicely without external help. People can use 5 different functions at the same time. You can even use this one outdoors if you feel like it. Thermostatic feature is the highlight of this product. The back of the curve facing wall isn’t covered. Contacting customer service can be a bit of a problem. AKDY JX-9821 AZ-9821 is rainfall and waterfall showerhead combo features sleek design and a brushed finish that looks classy. Installation is easy as is always the case with AKDY. You’ll get all the necessary parts within the package. It suits standard bathroom fittings perfectly. Besides the conventional waterfall and rainfall settings, you have spraying jets that allow you a full body massaging shower whenever you feel like it. Water pressure won’t really deter it from performance as the lowest water pressure count it works in is 29PSI. AKDY competes with shower panels in a unique way. This unit can operate with all the functions turned on. Plus, it balances out water pressure. You won’t feel the lack of water pressure even when all the functions are turned on. There’s a handheld wand for users to help them clean intricate parts of their body. AKDY JX-9281 AZ-9821 features cUPC rating in USA and Canada. You have good warranty that covers you from the damages. Also, AKDY will provide lifetime technical support for this shower panel. 6 body jets offer you massage-like shower. People can adjust the angle of the overhead showerhead. The functions work as advertised. This shower panel provides hot and cold showers. Releases a lot of steam in case of hot showers. No temperature controls for adjusting hot or cold showers. It’s either hot or cold. The best thing about a Shower panel is that it features massaging jets as well as drenching shower head and a hand shower the trick to utilize all these things is to have a right height. The massaging jets should be positioned at the middle part of your torso. They are meant to pour water onto your back and upper body. If you are too tall or too short, these jets will either spray water toward your legs or your belly. Unless you buy a panel with the right height, you’ll not be able to utilize the full potential of the bathing accessory you are buying. Limestone and other minerals are pretty common in urban areas these days. Don’t feel surprised if you find these minerals making their way to your home through the water supply of your house. And if any of the minerals get into the nozzles of your shower panel, good luck spending hours in cleaning. You can avoid the hassle in a smart way. Just buy a product that has anti-clog nozzles in place. You won’t have to worry about cleaning the nozzles and the panel every other day. In fact, they’ll clean themselves. Some of the expensive shower combos feature temperature control knobs and a digital display that shows the current mode they are operating in. These displays and temperature controls run on batteries. If you want to have a clear idea about what mode you are bathing with, you’ll do well to get one of these. Then you’ll have to work with batteries. When you choose one of these models, be sure to look for those which house the batteries in the middle. This’ll make changing them easier than those that have batteries at the top. Most of us might overlook the fact, but this is a vital thing when you are considering to buy an expensive bathroom fitting. You need to check the accessory for quality. Also, do a thorough check on your options in case the product arrives or becomes damaged after long term use. The manufacturers often back the item with the warranty period. The top shower panels have anywhere between one to three years of warranty to keep them safe. The longer the warranty period, the better it is for your product. Also, please verify for which cases the warranty applies before hitting the purchase button. Some of the top quality Shower Panels have jets and hand showers to go with standard fixed one overhead. Running these three at the same time means draining your water pressure. Most of the products available for purchase require at least 25 PSI worth of pressure to function. Make sure your water supply can withstand the minimum pressure necessary for these things to work their magic while you take a bath. Shower panels are designed to provide you the complete bathing experience. With the right product, you can enhance the aesthetics of your bathroom as well. Important things to consider here are the settings, temperature control, and the safety measures when you are looking for the best shower panel. Fortunately, all five in the list are from top brands which ensure these factors are well taken care of.